The crochet paper chain project is finished! Yay! However I'm pretty sure crochet paper chain wasn't on my 2017 project list was it? I need to go back and see how that list is coming along. This project came about because I wanted something small to do to have a little break from the ripple blanket project, that would be easy to dip in and out of, and just like the bunting, it is intended as a donation for the handmade stall at our school fete in September. That may still seem like forever away, but it takes me a while to do things, plus we have to move house between now and then. These photos were taken in Louise's ace photo taking spot when we went up to visit for a weekend. The seed for this project was seeing SFMGS's crochet chain necklace, here. And then as I was starting I saw a reference to Meet me at Mikes's post about crochet paper chain! I can't seem to find the actual post that I read first, it included a link to another paper chain project that was done granny square style, but as Pip said in that post, it's enough sometimes to see a picture of something to be inspired to go off and do things your own way. I figured out what I wanted mine to look like, nice and flat (ok flat-ish) like proper paper chain, with each link a single colour, and after fiddling with so many cowls that had been worked in the round, it seemed logical to create these little colourful loops in the round too. It took me a couple of tries to find the tidiest method for me. Now this isn't a pattern, because I don't know enough to write a pattern, but it will be a 'how I did it'. I used Patons Cotton Blend yarn, in 7 colours to match ROYGBIV. Trust me, using orange was very difficult, as I loathe it so, but I managed. Because ROYGBIV. I used a 4mm hook. I think this is a project where you want pretty tight stitches, so if your tension is a little loose, maybe go down half a hook size? 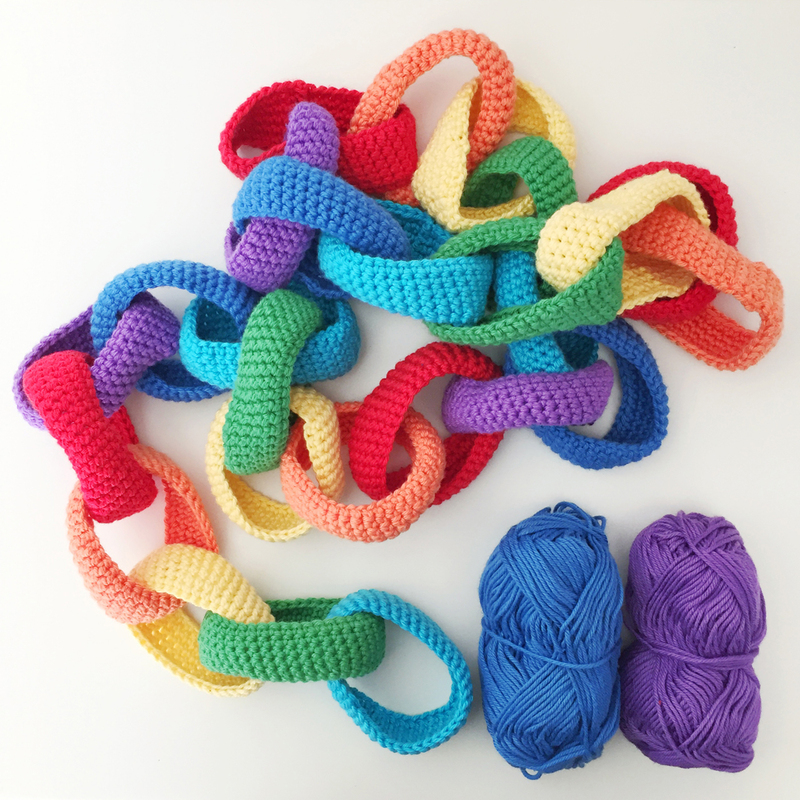 I created a chain of 40 stitches, joined the loop (you may want to experiment here to create a smooth join) and then double crochet (dc-UK or sc-US) into the back loop of each stitch until you complete your first round, then double crochet under both loops of each stitch until you have completed 6 rounds. At this point it can help to look up how to invisibly join, however I didn't find the tutorials I found much help, because they were for crocheting circles, not flat work in the round. I made my last stitch a slip stitch instead of a double crochet, which helped pull that step down a little. Careful with weaving in your ends that you don't just work back and forth near your start and end points, just that little bit more yarn can widen the appearance of your loop in that area. Spread out your weaving in ends away from your start and finish points. And then - here's the unexpected twist, I turn the loop inside out! You don't have to, but I prefer it that way. By the end I was getting my start and end points pretty tidy! 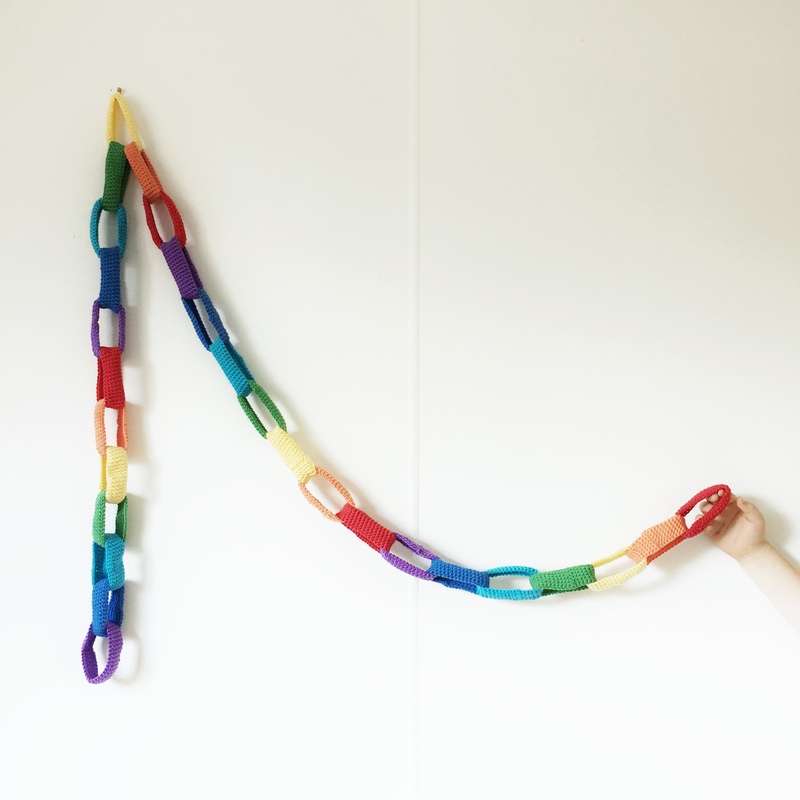 It can feel a little awkward when you first work your second chain loop, because you have to join through your first finished paper chain loop. My tip is work in those ends as you go, every single time. It will make for less stuff going on in your hands! Now that I'm done I love it, and think I may need to make some to keep. Maybe some rainbow for pulling out for birthdays, and metres and metres of the stuff for christmas. In white? Maybe white, pale grey, and some sparkly silver yarn, mmm lovely! I love the crocheted paper chain. It would look lovely in a kids bedroom or as part of annual decorators dragged out for birthdays, anniversaries or christmas. I hope they sell well at the fete!